Gov. Peter Shumlin discusses Vermont Health Connect improvements Thursday at the Statehouse. Gov. Peter Shumlin celebrated Vermont Health Connect’s second birthday Thursday by announcing a key fix to a problem that has plagued the insurance exchange since its launch. Speaking at a Statehouse press conference, the governor said the state was prepared to install a software upgrade that should smooth the system’s annual open-enrollment period, which begins next month. He said the online portal would go offline Thursday night so that the software could be installed and would be back in business Monday. Shumlin, who has long been criticized for over-promising and under-delivering on Vermont Health Connect, took great pains to speak cautiously about the improvements. Optimistic, he suggested, but still crossed his fingers. Shumlin said he was “thrilled” Vermont Health Connect had met the second of two deadlines he set for the system last March. At the time, he said he would abandon the state-based exchange if it could not automatically process changes in account information by May or if it was unprepared for open enrollment by October. If he missed either milestone, Shumlin said, he would sign Vermont up for the federal exchange or devise a state-federal hybrid. But on Thursday, the governor said that wouldn’t be necessary — or advised. According to a new estimate prepared by his office, moving to the federal exchange would cost the state far more than sticking with Vermont Health Connect. The transition alone would cost $24.5 million, $11 million of which would be borne by the state. Vermont would face an additional $5.5 million worth of annual costs thereafter, according to the estimate. 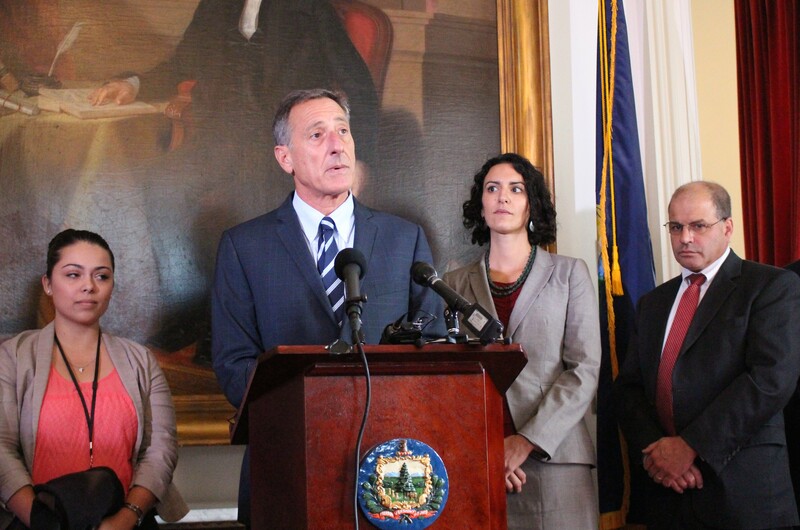 “I’ve always thought that going to the federal system was a really bad idea,” Shumlin said. Not only would it cost more, he argued, it would prevent the state from providing more generous health insurance subsidies to low-income Vermonters. Among the successes Shumlin announced Thursday were several related to Vermont Health Connect’s “change of circumstances” functionality. Since the system’s launch two years ago, customers have struggled to update personal information — such as changes in employment or family status — that can affect the cost of an insurance plan. Many have faced lengthy queues and inaccurate billing statements. In the past several months, Shumlin said, Vermont Health Connect staff members had been able to reduce the backlog of change-of-circumstances requests from 10,272 to just 186. Those final cases, complicated by a technological failure, will be manually resolved within the next two weeks, Shumlin promised. Starting Monday, he said, customers will be able to make changes to their account information online, instead of calling a customer service representative. Those who report a change by the 15th of the month will see it reflected on their next bill.